Get 25% Off For All Sweatshirts and Hoodies!! Get 25% Off For All Sweatshirts and Hoodies at Brooklynindustries.com. Including Men's, Women's and Kids. So Shop Now. No Code Needed. 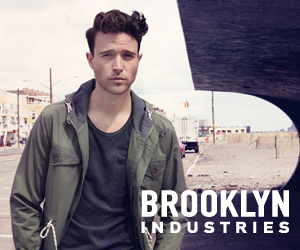 Take 25% Off For All Jackets and Outerwear at Brooklyn Industries. Shop Now. No Coupon Required. Extra 25% Off Sale Outerwear, Jackets and Blazers. Take an Extra 25% Off Already Reduced Outerwear, Jackets and Blazers. Shop Now. Mega Sale: Styles Up To 50% OFF!! Mega Sale: Get Up To 50% OFF Select Summer Styles from Brooklyn Industries. While Supplies Last. Shop Now. Buy One Get One & 50% Off on Select Men's and Women's Tanks, Tops, Sweaters and Shorts from Brooklyn Industries. Shop Now. No Code Needed. Save $20 OFF on Select Sweatshirts from Brooklyn Industries. Shop Now. Take 25% OFF Sale : All Memorial Day Weekend. Take 25% OFF Sale : All Memorial Day Weekend. Shop Now. Free Watertower Water Bottle With Purchase of $200 or More..
Free Watertower Water Bottle With Purchase of $200 or More.. Use Code: WTBOTTLE15 at checkout. Free Skyline Umbrella with Any Purchase of $200 or More..
Free Skyline Umbrella with Any Purchase of $200 or More at Brooklyn Industries. Add umbrella to cart and then enter discount code UMBRELLA15 at checkout. Shop Now. Save 25% OFF On ALL Messengers & Backpacks from Brooklyn Industries. Shop Now. No Coupon Needed. Save 20$ Off Select Brooklyn Hoodies!! Save $20 Off on Select Brooklyn Hoodies. With coupon code: BKIHOODIE20 at checkout. Shop Now. Save 20% OFF Any Full Price Cold Weather Accessory with An Outerwear Purchase. With coupon code: COZYUP20 at checkout. Take 25% Off All Sweaters!! Take 25% Off All Sweaters from Brooklyn Industries. Shop Now. No Code Required. Buy One Get One 50% Off Select Pants and Tops!! Buy One Get One 50% Off Select Pants and Tops from Brooklyn Industries. With coupon code: SELECTBOGO at checkout. Save 30$ Off The Women's Moto Parka. Moto Fishtail Parka. A highly customizable utilitarian parka that's ready for any weather. Features a durable twill body with a fishtail vented back and drawstring waist for a slim fit. A removable, faux fur trimmed hood offers a classic parka element while also shielding your face from the chill. Details include snap button-tabbed cuffs, removable hood and trim, and multiple pockets for all your odds and ends. Snap button and drawstring vent found in the back allow for a customizable, feminine a-line silhouette. Parka includes a removable quilted, polyester filled lining for an additional layer of warmth. Buy this and you can Save $30 Off The Women's Moto Parka. With coupon code: MOTO30. Fall Stock Up: Take 20% Off Orders of $225 or More..
Fall Stock Up: Take 20% Off Orders of $225 or More at Brooklyn Industries. And use coupon code: FALL225 during checkout. Fall Stock Up: 15% Off Orders $125 - $249.99! Fall Stock Up: Get 15% Off Orders $125 - $249.99 at Brooklyn Industries. With coupon code: FALL125 during checkout. Get Free US Economy Shipping!! Get Free US Economy Shipping!! When You Buy 3 or More Items at Brooklyn Industries. Shop Now. No Code Needed. Save 16$ Off on Buchanan Sweater Hoodie for Men! Buchanan Cotton Hoodie. A 100% cotton sweater with raglan sleeves and kangaroo pocket. Drawstring hood. Buy this and you can Save $16 Off on Buchanan Sweater Hoodie for Men! Save 25$ Off on The Patricia Sandal! Patricia Suede Sandal. In premium suede and leather, these ultra fem flats are lightweight enough that they easily transition from day to night. Features a rubber sole, leather foot bed, and adjustable leather ankle strap. So buy this Sandal and you can Save $25 Off on The Patricia Sandal! Summer Sale : Up to 50% Off Hundreds of Styles!! Summer Sale : Save Up to 50% Off During the Semi-Annual Sale! Hundreds of summer styles marked down. Shop Now. No Code Required. Get 20% OFF Full Price Orders of $100 or More... from Brooklyn Industries. And use coupon code: BBQ20 at checkout. Take 30% OFF Full Price Orders of $200 or More..from Brooklyn Industries. With coupon code: BBQ30 at checkout. Take An Extra 25% Off Sale Dresses!! Take An Extra 25% Off Sale Dresses at Brooklyn Industries!! So Shop Now. No Code Needed. Buy One Get One 50% Off Select Spring Styles!! Buy One Get One 50% Off Select Spring Styles from Brooklyn Industries!! Use coupon code: SPRING50 at checkout. Shop Now. Mega Sale - Winter Styles Up To 50% Off!! It's that time of year! Mega Sale - Winter Styles Up To 50% Off!! From Brooklyn Industries. Buy Now . No Code Required. Take 40% Off on Select Accessories!! Get 40% Off on Select Accessories. Like Winter Hats, Scarves, Gloves, Belts, Tights & More! From Brooklynindustries.com. Buy Now . No Code Required. Brooklyn Industries is a cutting edge design company that sells its innovative clothes exclusively through its 16 retail stores and online website. Brooklyn Industries’ stores engage the local community in art, clothing, design and style.